The weirdest stuff just walks into the shop, huh? 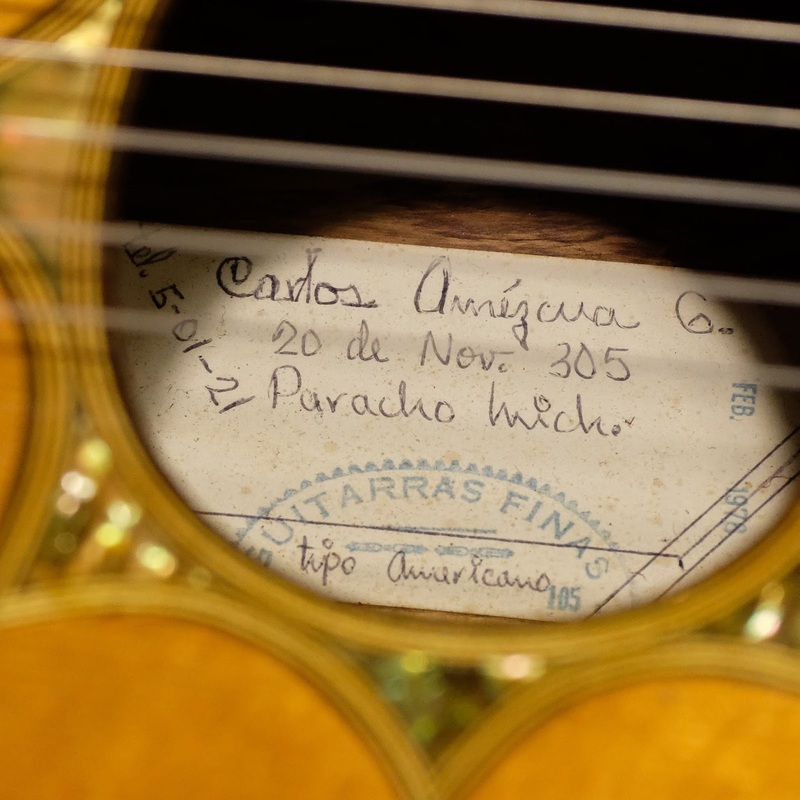 I have a fondness for nicely-made Mexican guitars (and requintos... and vihuelas) from Paracho and have had some fun ones through now and then. This one takes the cake, however. It's braced like a classical/flamenco guitar inside with extra-light fan bracing, but its format is that of a cutaway steel-string guitar -- a C-shaped, 14-fret neck with radiused fretboard, reduced-round-shoulder-dreadnought body shape, and pin bridge string-load. The build is feather-light, too, and gives you a belly-rub as you play it. I'm not really sure what the builder intended, though. 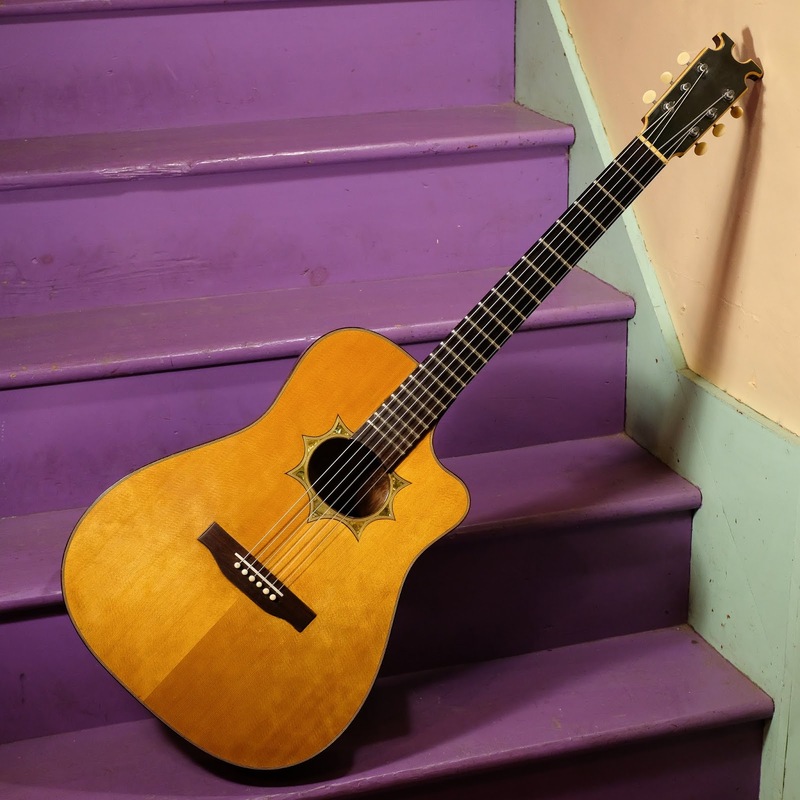 The label calls it "Tipo Americano" inside and it was built with a misplaced steel-string compensated saddle (way too sharp) and solid headstock with heavy Grover Rotomatics installed. 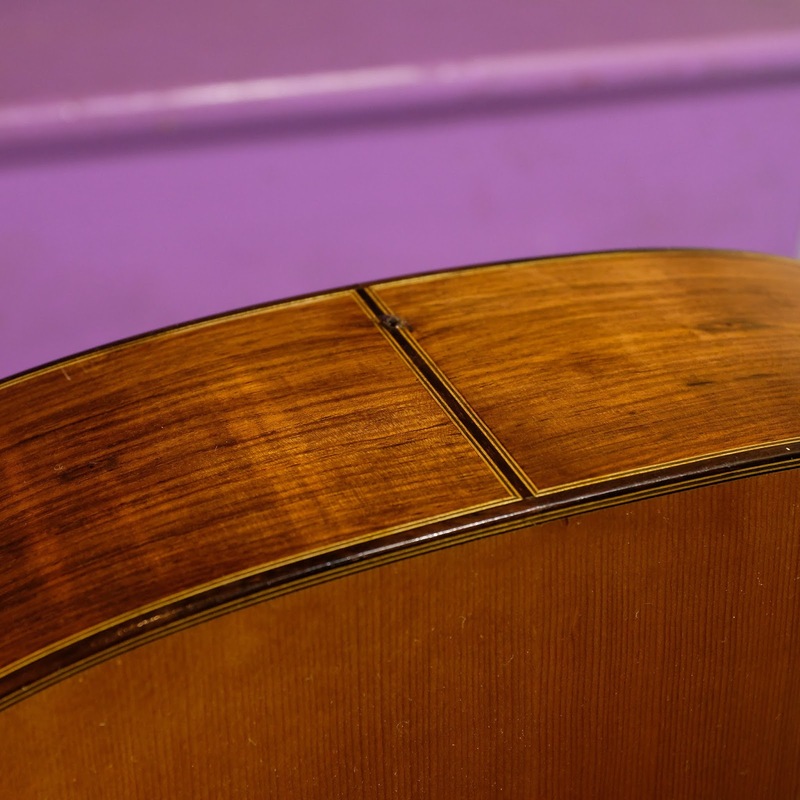 Unfortunately, the super-light fan bracing meant the top had domed-up over time with the 11s-gauge steel that was on it when it came in. Tonally, the steel was also really zippy-sounding and bright without a lot of body. 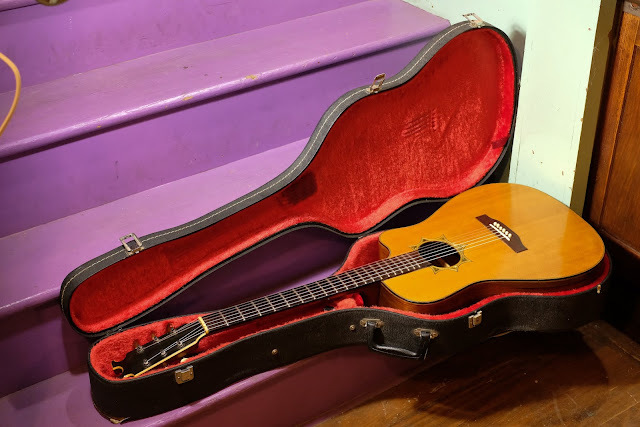 Anyhow, I knew that it could be an interesting guitar post-work, so I took it in partial trade towards another instrument in the shop. I think I'm going to hold onto this for at least a while, too. After finishing-up for the day, I must've sung songs with this for a good hour and a half before I noticed time was moving. 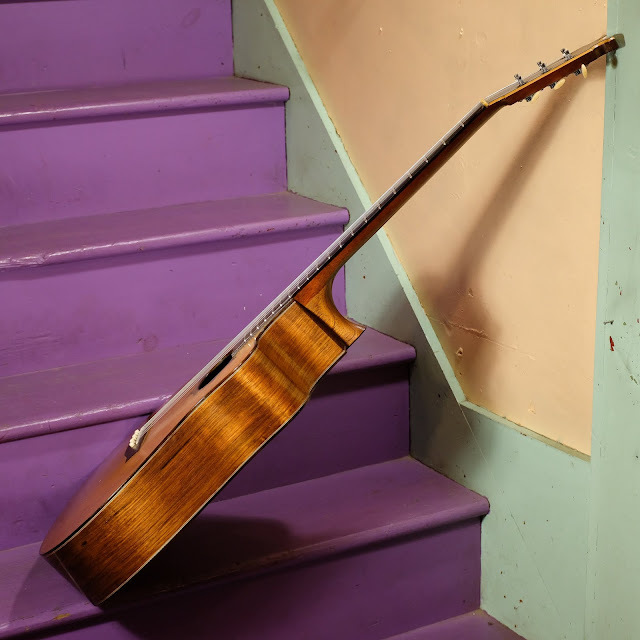 I've always liked the idea of a "crossover" nylon-strung guitar and this is basically the prototype of one! Work included: a fret level/dress, new StewMac Golden Era tuners at the headstock, a bridge shave and pinhole fill/redrill, relocation of the saddle slot, and a new bone saddle with no compensation (classical-style). I strung it up with a medium-tension set of normal nylon strings and heck, it sounds great! 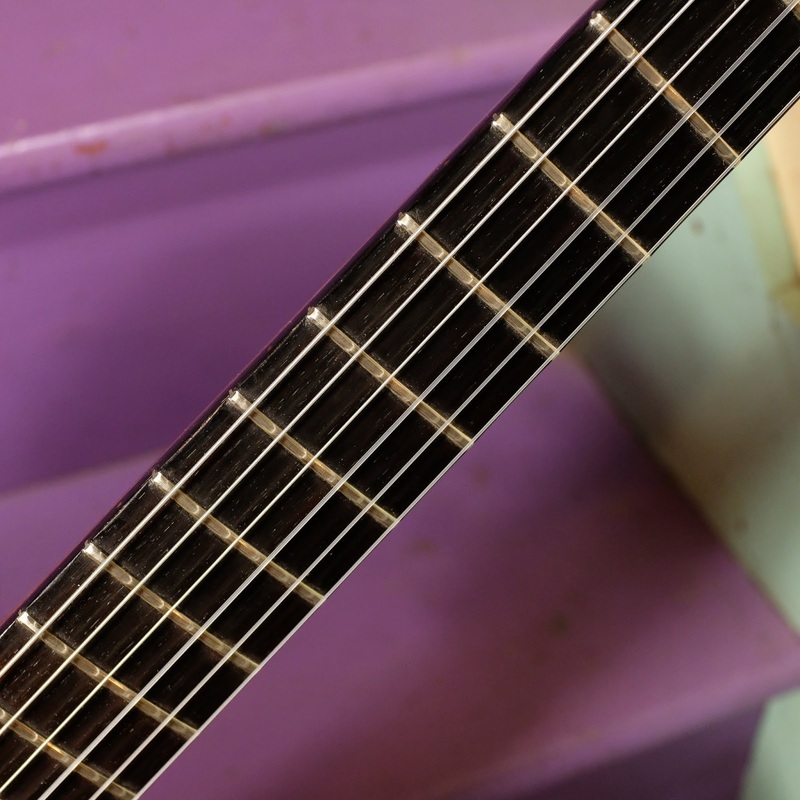 The neck is straight and it plays spot-on with 3/32" action at the 12th fret overall. 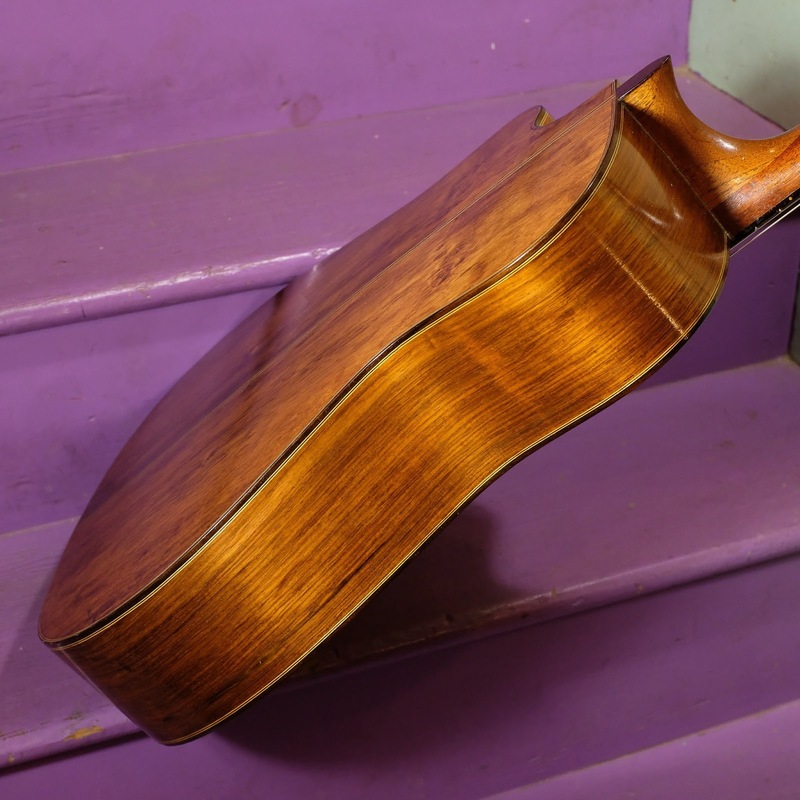 String spacing at nut: 1 11/16"
Upper bout width: 10 3/8"
Condition notes: some of the finish has "runs" or "drips" on the back as it looks like it either got warm at some point or the guitar was simply finished with a brush when it was made. It's not super-obvious unless you're looking for it. 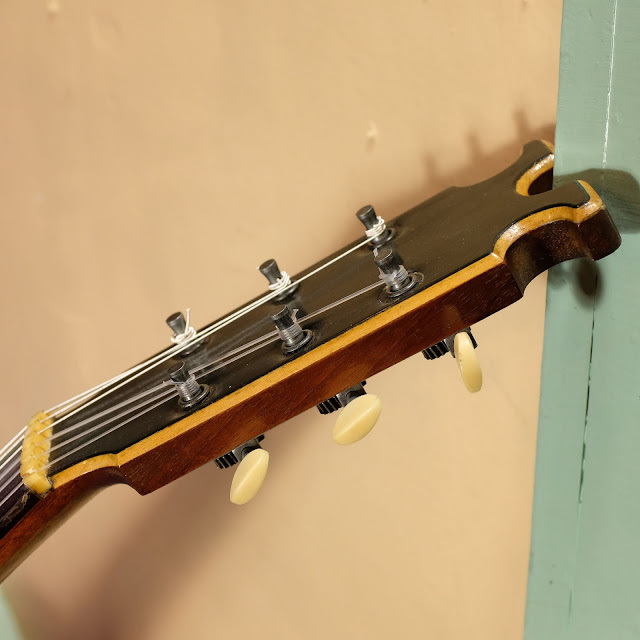 There are no cracks -- shockingly -- and the only non-original features are the tuners (which saved a lot of weight at the headstock and look cooler) and the new saddle. 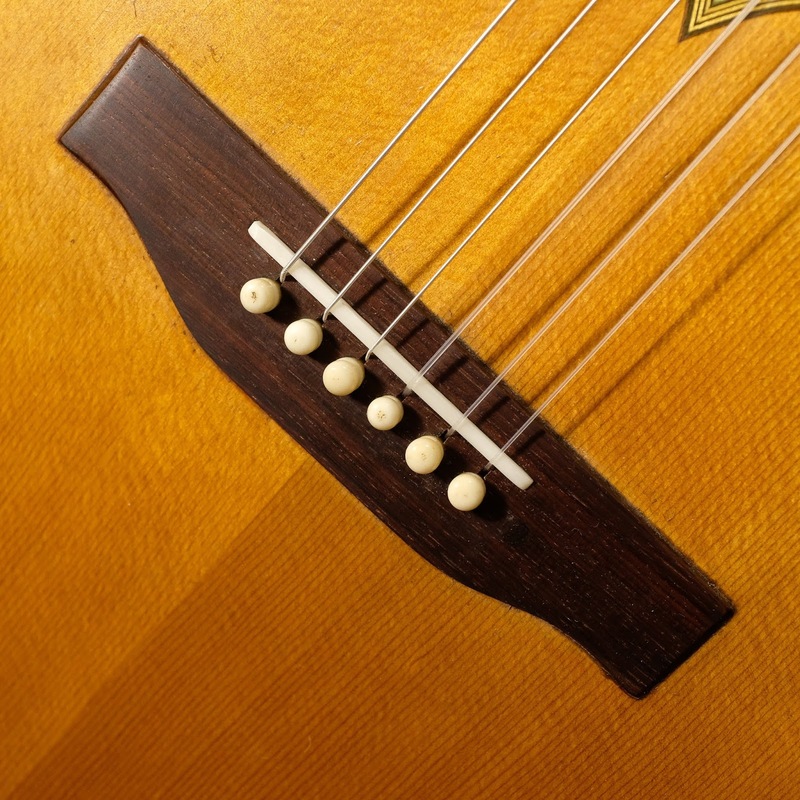 The worst fault of this instrument is that the fret spacing is not quite bang-on in the middle of the neck and some notes play a hair sharp or flat around frets 5-7. 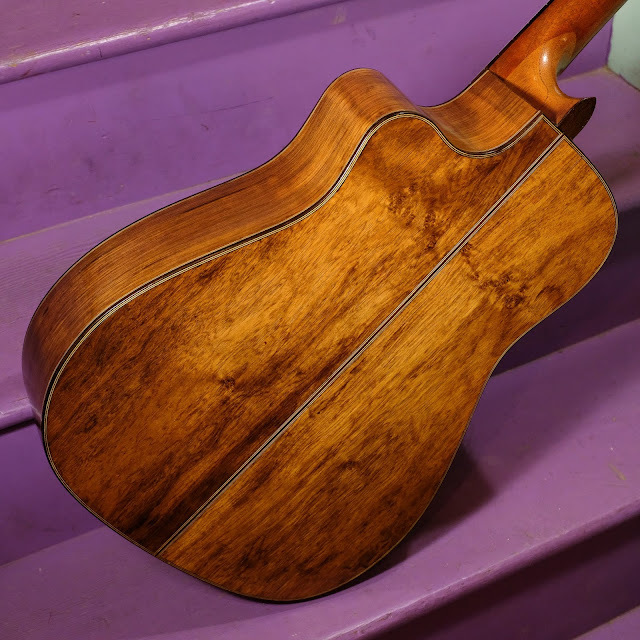 It's not terrible, though, and not noticeable except with sustained barred chords in the region. It comes with: its original hard case with maker's mark on the lid. I love the looks of this thing, though I wish the bridge were rectangular, of course. 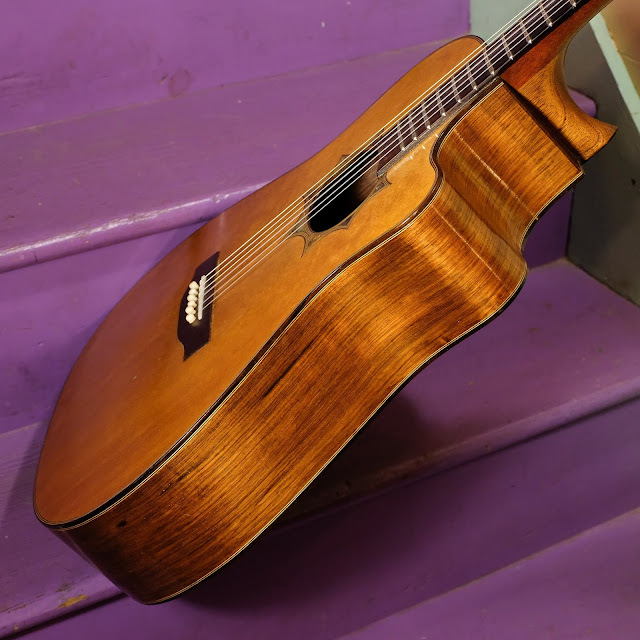 The instrument is totally elegant and has rosewood binding with multi-ply contrasting strips at every edge. The soundhole is also similarly-pretty with star-shaped chunks of inlaid abalone in a pattern seen on lots of vihuelas and requintos. 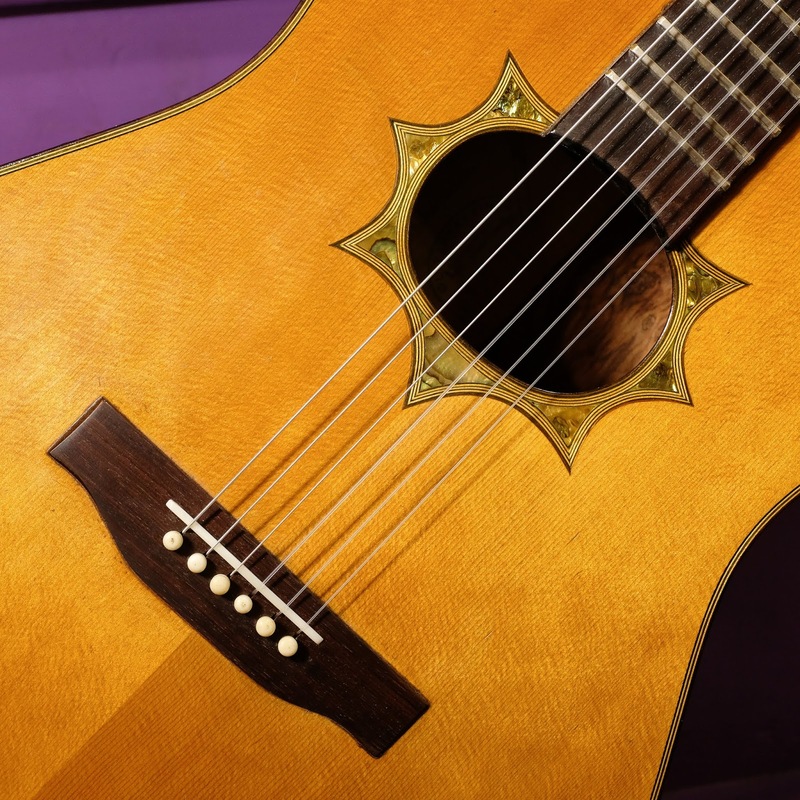 In fact, the soft cutaway mimics requintos quite a bit. 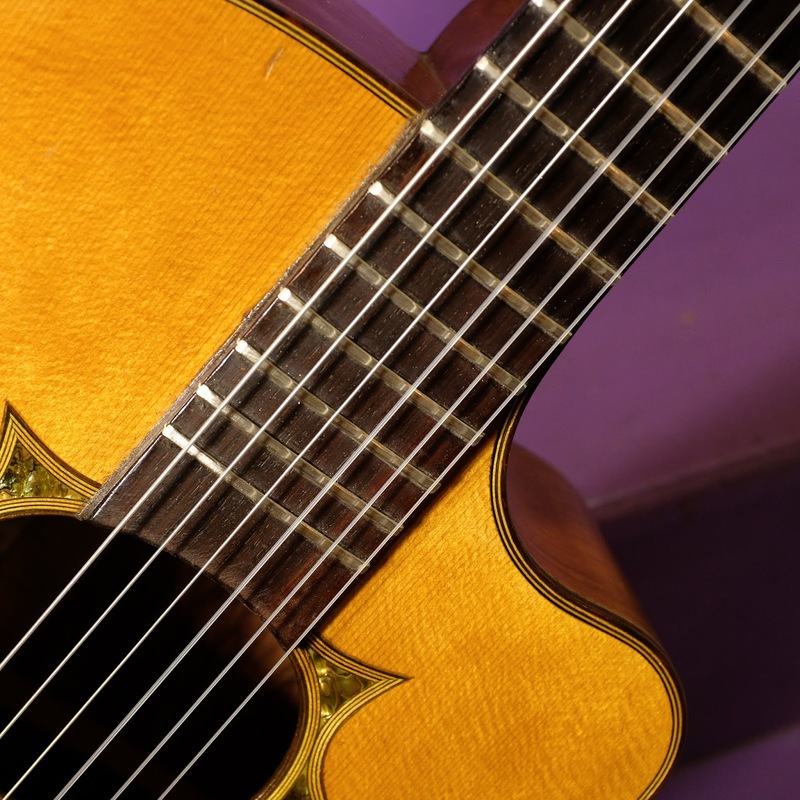 After work, this sounds like a very good flamenco guitar. 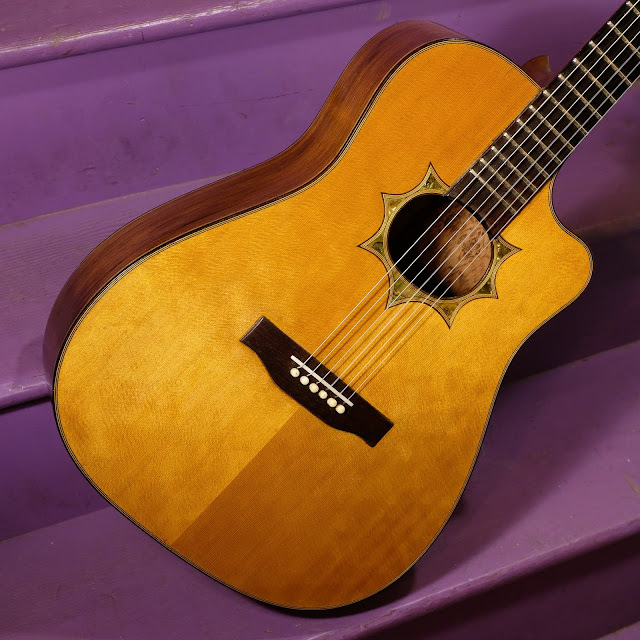 Unlike a 12-fret classical of this lightness, this guitar isn't overly-tubby and the tone is bright, clean, and rich. It's quite sweet and pulls a lot of bass but it's still very clear. 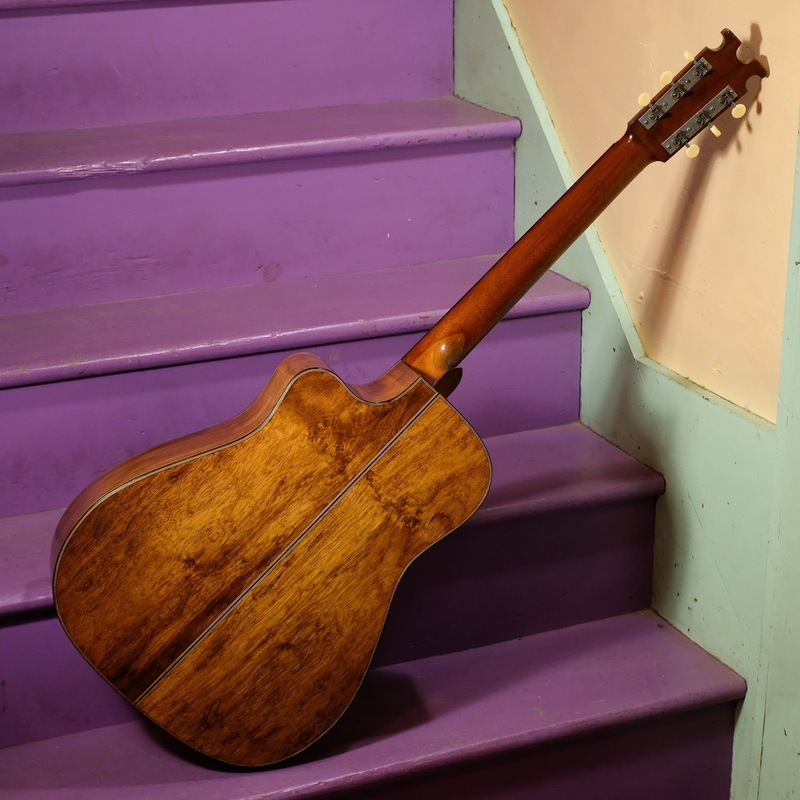 I like to mix a lightweight pick into my nylon-string playing (for a gypsy-jazz tone) and this takes that -- and traditional nylon-style playing -- very well. 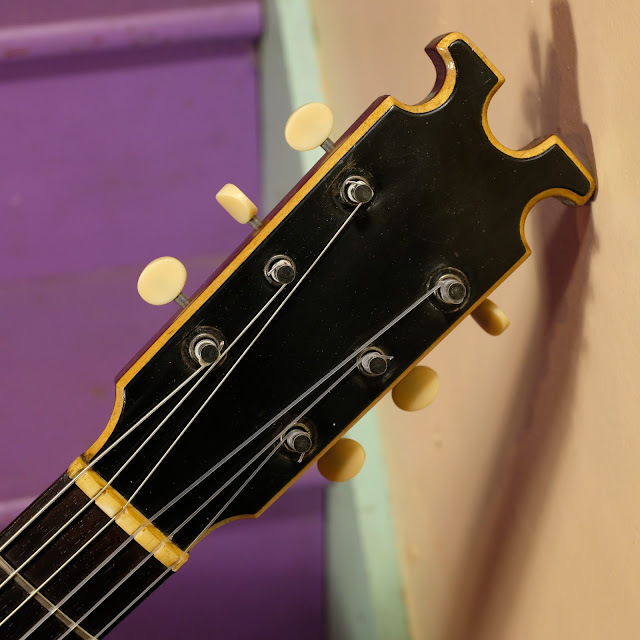 The headstock shape is both crazy and lovely. The corners are rounded-off into the contrasting lighter wood. Huge, jumbo frets were used when it was made. There are also side dots. 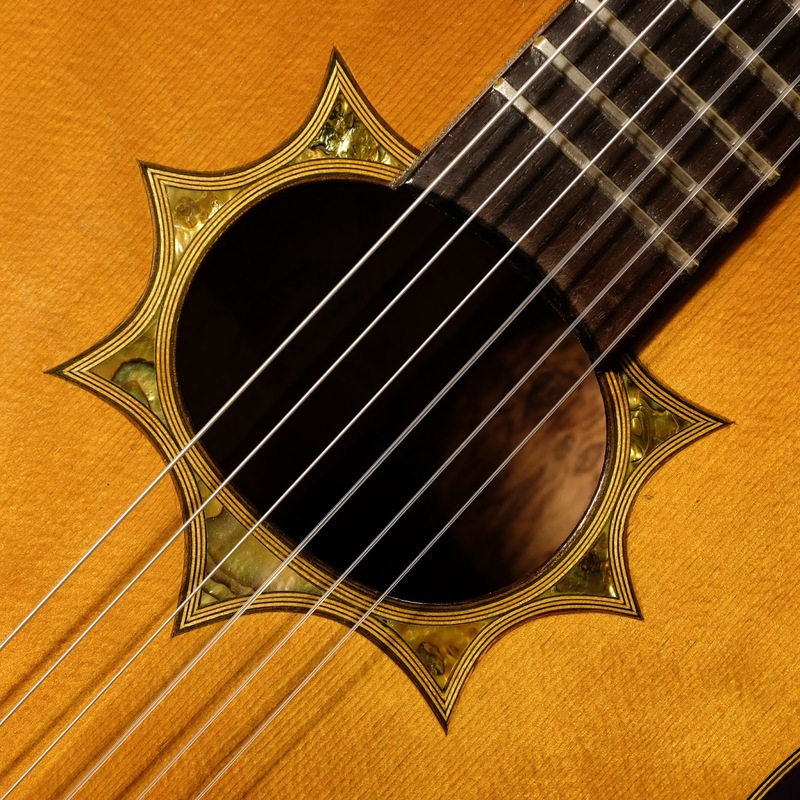 My kids adore the soundhole rosette. I had to shave the bridge like crazy to get action where I wanted it. 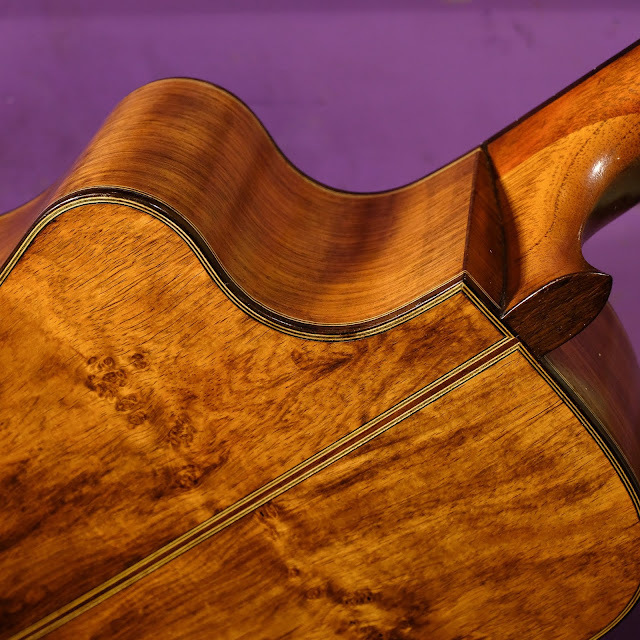 This has a Spanish heel so a neck reset was not something I looked forward to. There's a fair-sized softwood bridge plate under it so I'm not too worried about warp/deflection to the top over time with the thinned-up bridge. It's been stable since work a few days ago, too. The back and sides look like palo escrito to me. 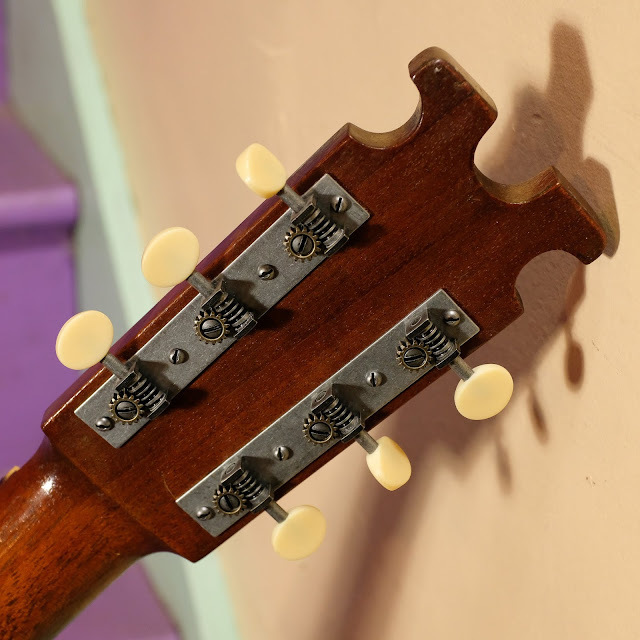 I can't tell you how much the StewMac repro-style tuners saved the headstock for me. The original Grover Rotomatics made the guitar entirely top-heavy.